Dr. Paul Thomas, a Dartmouth-trained pediatrician based in Beaverton, Oregon, who has over 13,000 children in one of the largest integrative pediatric practices in the United States, spoke last night to a standing-room-only crowd at Bloomsbury Books in Ashland. 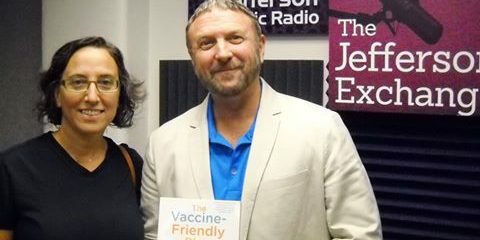 Thomas, who calls himself a “vaccine-friendly doctor,” explained that vaccines are given in his office every day, and that he has seen the benefits of vaccines firsthand. He grew up in the former Rhodesia (now Zimbabwe), Thomas said, where one of his playmates died of measles. When he was in residency and an improved vaccination against Hib (Haemophilus influenzae type B) was introduced, Thomas said he saw the death rate from meningitis “drop by half” at his hospital. Thomas pointed out that today more than five times as many vaccines are given to children than in 1983. He also stated that while vaccines are tested for safety by the developers before they are put into mainstream use, there are no scientific studies that show that the current vaccine schedule is safe. Two of the toxins he is particularly concerned about are acetaminophen (the main ingredient in Tylenol and over 500 other over-the-counter and prescription medications) and aluminum, which is added to vaccines as an adjuvant. The safe amount of aluminum for a baby who weighs eight pounds at birth, according to the FDA, Thomas said, is between 40 and 50 micrograms. The hepatitis B vaccine, which is given to newborns, contains 250 micrograms of aluminum, five times the safe amount. In his pediatric practice, Thomas recommends that parents wait to give the hepatitis B vaccine until children are teenagers or sexually active, and that parents space out aluminum-containing vaccines for their children, giving only one aluminum-containing shot at a time. Of the children born into his practice since 2008, those who followed his vaccine-friendly plan (1,098 kids) had no new incidents of autism. Among children in his practice who received the hepatitis B vaccine at birth or were vaccinated according to CDC guidelines (894 kids), however, there were 15 cases of autism (1 in 60). Thomas has a YouTube Channel of over 198,000 subscribers. 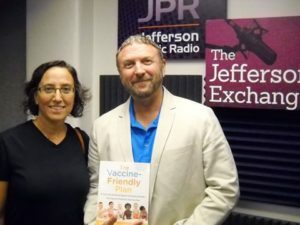 He spoke at Bloomsbury to promote his new book, co-authored with Ashland’s Jennifer Margulis, Ph.D., titled The Vaccine-Friendly Plan: Dr. Paul’s Safe and Effective Approach to Immunity and Health, From Pregnancy Through Your Child’s Teen Years. Thomas and Margulis were introduced by Rick Kirschner, a retired naturopath and author of seven books, including the bestseller Dealing With People You Can’t Stand.